Editor note: Over the past year, China Water Risk has been collaborating with BlueTech Research, a global provider of water technology market intelligence. This collaboration has resulted in a joint report titled “Power Sector in China – Water Technology Market Opportunities and Drivers” as well as webinars to help international water tech companies better navigate the wastewater treatment market of the power sector in China. This article is based on the key findings from the joint report. The full report is available on the inside.bluetechresearch intelligence platform. China’s power sector is changing but remains overwhelmingly dominated by coal, which has led to chronic air pollution problems in some regions. Sulphur dioxide (SO2) is targeted as one of China’s main air pollutants, with coal-fired power stations being a significant source (in 2007, they accounted for around 50% of total SO2 emissions). 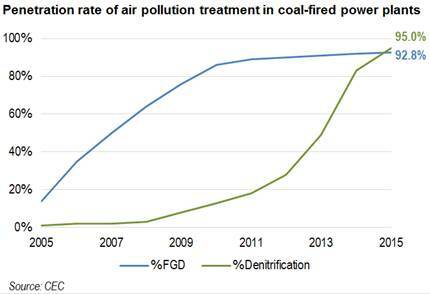 Since then, tightening regulations have resulted in most of China’s thermal power generation capacity being equipped with Flue Gas Desulphurization (FGD) and denitrification (DeNOx) equipment to combat air pollution – see the figure below. Ironically, FGD systems, which are used to remove SO2 from the emissions of power plants, create complex and difficult to treat wastewater, and in great quantities since the water demand of the process is significant. This has led to an opportunity for wastewater treatment in power plants. As acknowledged by the Ministry of Environmental Protection (MEP), the wastewater from FGD is the most challenging and difficult wastewater to treat in thermal plants. Unless the power plant is air-cooled, cooling water is by far the main source of wastewater discharge. In closed-loop systems, blowdown from cooling tower accounts for 70-80% of wastewater volumes. However, the wastewater that needs the most treatment comes from the FGD process, and includes various pollutants such as organic compounds, salts, particulate matter as well as heavy metals. The China Environment Protection Industry Association has estimated that wastewater treatment of FGD alone could represent a market of around RMB100 billion (USD14.5 billion) during the 13FYP (2016-2020). While the most common method of treating FGD water is Limestone-Gypsum, interest is growing in zero liquid discharge (ZLD). ZLD is a water treatment process in which all wastewater is purified and recycled; therefore, leaving zero discharge at the end of the treatment cycle. 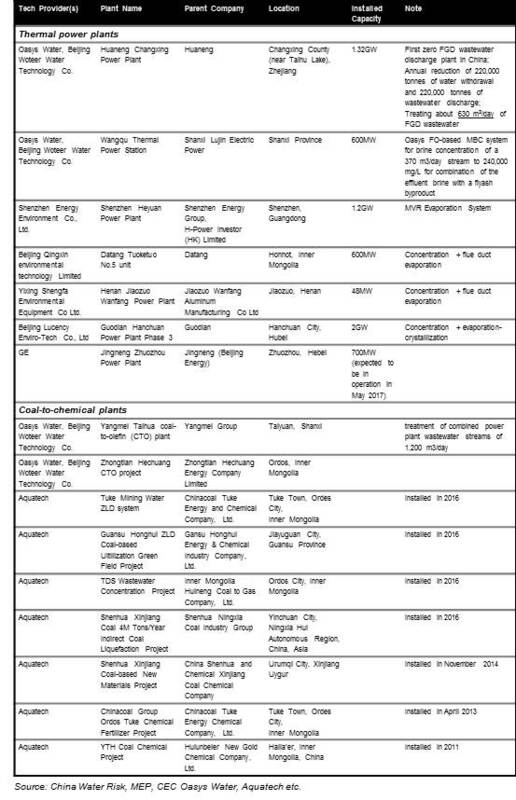 ZLD is not yet mandated at the national level, but has been adopted by at least 7 thermal power plants and 10 coal-to-chemical plants (see table below). BlueTech and China Water Risk expect the number of plants fitting ZLD to continue rising over the next 5 years. Despite the lack of a national regulation mandating ZLD, its use is starting to be encouraged by the authorities in other ways. ZLD technology for coal-to-chemical wastewater with high concentrations of phenol and ammonia, is identified as one of five cleaner fossil fuel conversion technologies that will be piloted and tested during the 13FYP (2016-2020) (National Energy Administration, 13FYP on Energy Technology Innovation). The provincial government of Shanxi has gone further and committed to a push for ZLD for all industrial wastewater from power, steel, coking and coal washing during the 13FYP (2016-2020) (Shanxi Provincial 13FYP on Environmental Protection). 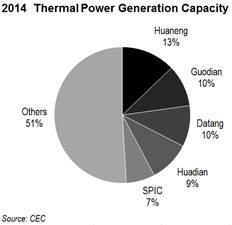 Shanxi was responsible for 24% of China’s coal output and 6% of China’s coal-fired power generation in 2014. Another factor is the encouragement towards cleaner coal-fired power generation. The Cleaner Production Scheme, which encourages companies to move beyond mandatory compliance by meeting certain benchmarks. Under the scheme, companies can qualify for cash rewards, better access to loans or tax breaks. Other regulatory changes are increasingly emphasising water efficiency and reuse in power plants. Most recently, the government published ‘Policies on Pollution Control Technologies of Thermal Power Plants’ in 2017, which as well as FGD, encourages power stations to use evaporation and crystallisation methods to realise zero wastewater discharge. All thermal power plants were required to obtain Pollution Discharge Permits for wastewater by 30 June 2017. 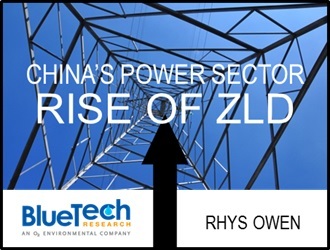 As well as regulatory pressure, the dynamics of the power industry are also conducive to the growth of interest in ZLD. Coal currently represents 65% of China’s electricity generation, and despite a decline in overall share due to an increased focus on renewables, is still expected to be at 53% in 2030, according to the National Energy Administration. There is also a trend towards fewer but larger power stations. As of 2015, more than 40% of China’s power generation capacity lay in large units (greater or equal to 600MW). This share was only 14% in 2005, and continues a trend in place since 2007. All of the thermal power plants equipped with ZLD are over 600MW. The largest power generation companies are often referred to as the “Big 5”, namely Huaneng, Guodian, Datang, Huadian and State Power Investment Corporation (also known as China Power Investment Corporation). These five companies represent almost half of China’s thermal power generation capacity. Power is one of the highest-spending industries in terms of wastewater treatment. In 2014, the power and heat generation sector spent at least RMB3.2 billion (USD465 million) on wastewater treatment, the sixth highest spending industrial sector of 42 listed by the government. The shift in the power industry to fewer, but larger power stations, the persistence of coal, and the almost complete penetration of FGD and DeNoX technologies, combined with increasing regulatory encouragement towards ZLD, all point to likely growth in the number of installations in the coming years. Fundamental Issues: Industrial Wastewater – Professor Ma Zhong, dean of the School of Environment of Renmin University gives his in-depth views on the industrial wastewater standards & pricing. Is it cheaper to pollute than to treat? Rhys Owen is Editor-in-chief at BlueTech Research. Before joining BlueTech in 2016 Rhys worked for eight years at Global Water Intelligence, where he was deputy editor of the magazine and founded and managed Desaldata.com. He was previously responsible for the Sunday Times Tech Track 100, a league table of emerging UK technology firms, and worked in the marketing department for anti-malware firm Sophos. Rhys studied at Manchester Metropolitan University, obtaining his degree in Biology and Psychology.